At the start of 2016, We Are Social reported that there were a total of 3.4 billion internet users in the world; which translates to 46% of the global population having access to internet. Internet penetration has transformed the way businesses are run and transactions are carried out, paving the way for a bustling era of e-commerce and digital payments. Whilst there are different e-commerce models ranging from B2B, B2C and C2C, digital payment apps are also closely connected to e-commerce, and are offering people new and innovative ways of making payments. According to a study compiled by Statista, in 2014 B2C e-commerce sales worldwide were projected to reach $ 1.5 trillion by 2018. The 2016 edition of the Asia 500 report published by Internet Retailer revealed that the Asia Pacific e-commerce market is already worth $ 834.71 billion, an increase of 32.1% from the $ 631.81 billion that was recorded in 2014. Sri Lanka is currently on its own journey of growth and e-commerce and digital payment companies are starting to win over customers. In this month’s edition of the ‘People of Progress’ series, we take a closer look at the industry, through insights provided by professionals at the helm of e-commerce and digital payment companies, we have also taken the input of business experts into consideration. Our hope is to provide a holistic view of the industry and select businesses, enabling you to understand their positions, their individual success stories, pain points and challenges, whilst obtaining a greater understanding of the trends and opportunities that are part of Sri Lanka’s e-commerce narrative. Sheyantha Abeykoon, the CEO of wOw.lk (a unit of Dialog Axiata PLC), is a Wharton MBA graduate who has over 17 years of experience spanning across industries such as financial services, retail and digital services. He has also worked in both entrepreneurial and corporate settings in Sri Lanka and overseas. Abeykoon has played an integral role in building wOw.lk into a leading e-commerce site, and has helped steer the company through several important transitions. Some people still remember wOw.lk in its early days, when it was known as anything.lk, the site that pioneered the concept of daily deals, and injected fun and excitement into the online retail space. 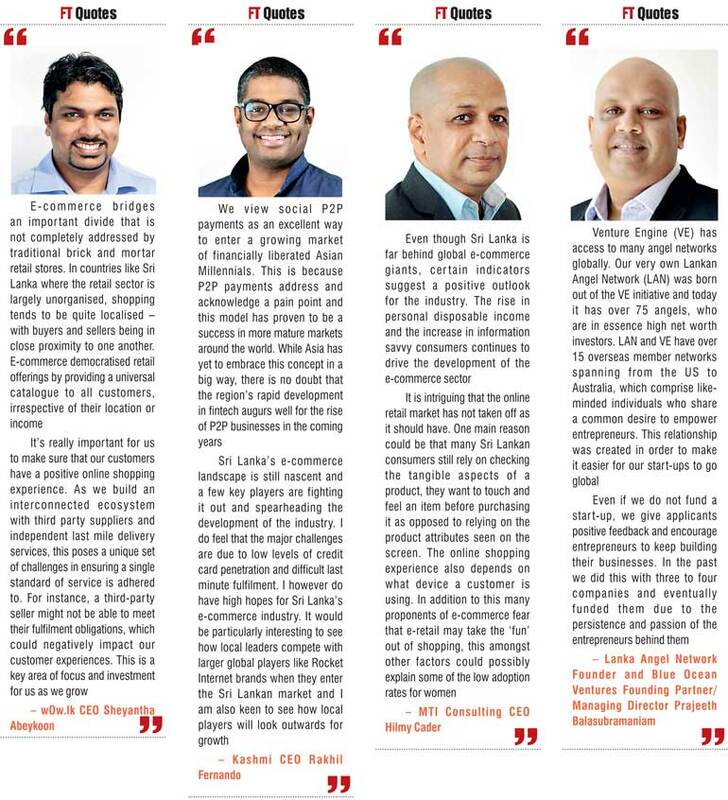 wOw.lk is currently ranked by startupranking.com as the top e-commerce start-up in Sri Lanka, and it has now obtained the status of a well-established business and has become a dynamic end-to-end consumer site that offers customers access to a diverse range of products and services. Rakhil Fernando – CEO, Kashmi, started his career in banking and private equity, but eventually decided to delve into setting up start-ups. Inspired by Venmo, the peer-to-peer (P2P) payments app that was developed in the US, Fernando felt that Asia also needed a similar solution. His three co-founders and he formed Kashmi, bootstrapping the company for a year and a half on their own funds, until they completed a seed funding round, which raised SGD 750,000. Following the creation of a successful prototype in 2014, Kashmi was officially launched in Singapore in 2016. Since its launch in January 2016, Kashmi has acquired over 7,000 registered users with an average wallet top up of SGD 200. The current aggregated gross transaction volume is on a run rate of over SGD 300,000 (approx Rs. 30 million) a month, an encouraging sign for a start-up that has only been operational for five months. Commenting on trends and insights that he has observed in the e-commerce industry, Cader said: According to a research study conducted by Kaymu it was observed that members of the population falling between the age brackets of 25-34 were more likely to make use of e-commerce platforms than other generations. This is particularly because Generation Y tends to be more technologically savvy than most of the other generation groups. Moreover, it is this very group that prefers online shopping to traditional alternatives. He further added: “We look for several key aspects in each application that is submitted to Venture Engine. The most important factor is the team, we always consider whether the team has the requisite domain expertise and the passion and drive to work 24/7 for 8-10 years to build a great company. The other key thing is the space – we evaluate whether the addressable market is large enough to build a very large company over the next 10 years. Although we fund companies at the idea stage, we are now seeing many more start-ups that are up and running – so we look at the early metrics on user acquisition and engagement. As people around the world increase their acceptance of online platforms and embrace the convenience of e-commerce and digital payment applications, they are shaking up tradition and revolutionising the way that trade is done. The immense potential of e-commerce remains undisputed. However the way ahead for all global players in the industry will be a quick paced marathon of perseverance and endurance, and it remains to be seen whether Sri Lanka’s e-commerce industry will merely limp behind the front runners, sprint alongside them or someday, even dare to take over. Even though the industry in Sri Lanka is still running under an ‘early days’ banner, it cannot do so for forever. It’ll undoubtedly take the very best efforts, innovation and commitment of both established players and new entrants, the Government and investors to unleash the industry’s full potential. Hurdles will have to be overcome, perceptions will have to changed, creativity and new thinking will have to be applied, policies will have to be put in place and above all trust will have to be instilled in customers. If people don’t have the resources or access to explore the world online, or if they don’t have trust in the process of clicking ‘buy’ or ‘pay’, then customers and industry players will be locked in an eternal game of tug of war. E-commerce and digital payment companies have to focus on their customers and do whatever it takes to get them to join the race and integrate the use of e-commerce into their daily lifestyles.